Live. Laugh. Love. and EAT in between! : BonChon Chicken Boxed Meal for Php 6?! 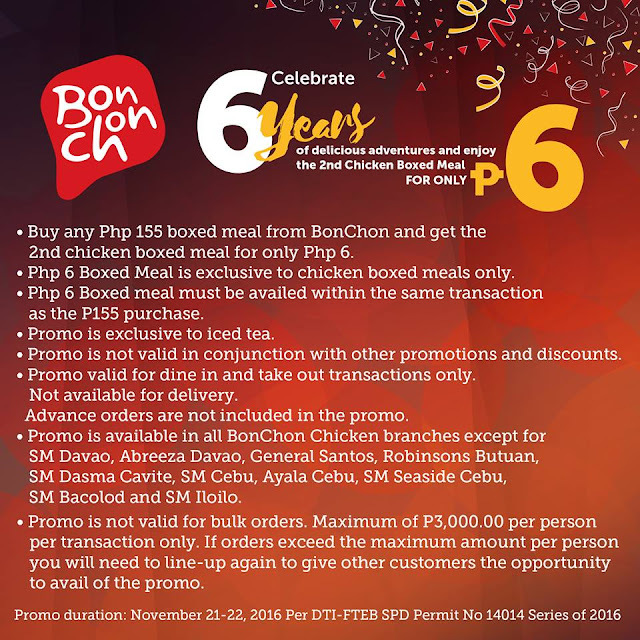 Buy any Php 155 boxed meal from BonChon and get the 2nd chicken boxed meal for only Php 6! This promo is exclusive to chicken boxed meals only. Php 6 Boxed meal must be availed within the same transaction as the Php 155 purchase. Promo valid for dine in and take out transactions only. Advance orders are not included in the promo. 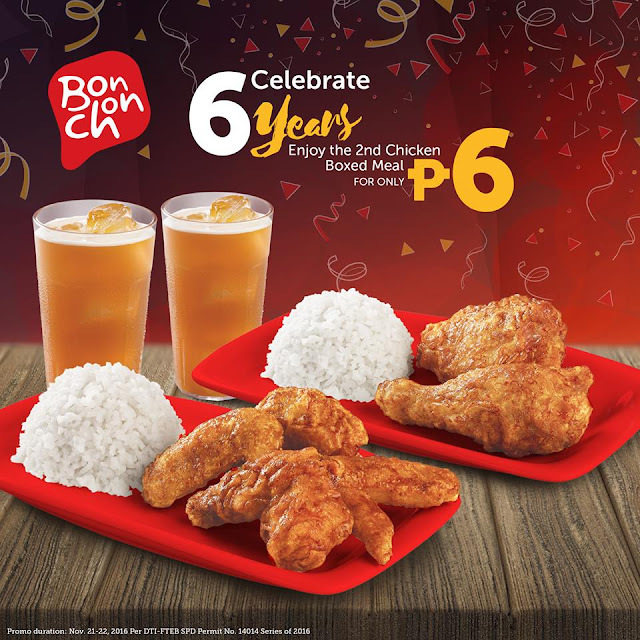 Promo is available in all BonChon Chicken branches except for SM Davao, Abreeza Davao, General Santos, Robinsons Butuan, SM Dasma Cavite, SM Cebu, Ayala Cebu, SM Seaside Cebu, SM Bacolod and SM Iloilo. Promo is not valid for bulk orders. Maximum of P3,000.00 per person per transaction only. If orders exceed the maximum amount per person you will need to line-up again to give other customers the opportunity to avail of the promo. Or you might want to screengrab this image for easier access! Hurry up now, we can only avail the glamorous Php 6 - chicken meal today until tomorrow! Check out BonChon Chicken Philippines Facebook page for more updates!